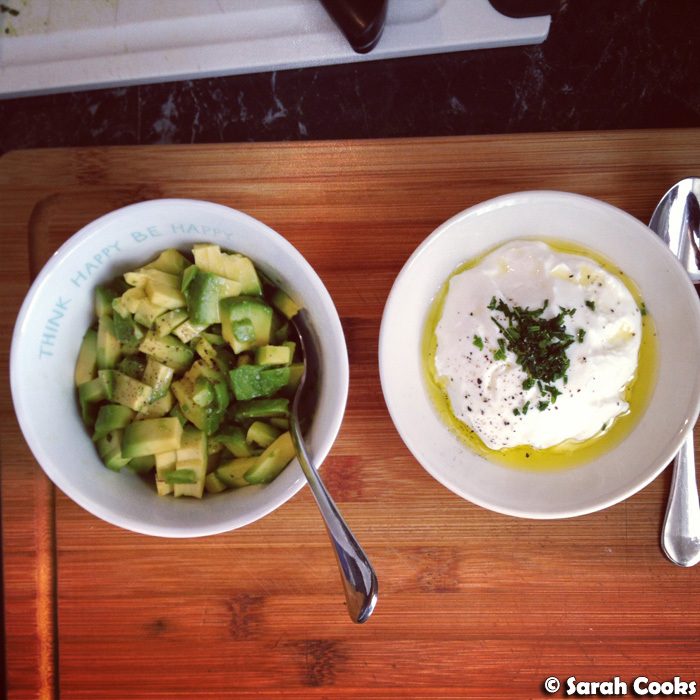 As you know, I love making quick-yet-nourishing weekday breakfasts, styling them prettily and instagramming them. On weekends, I've gotten into the habit of making slightly more involved cafe-style brunches - it takes a bit of time, but the results are delicious, and I do love pottering about the kitchen! 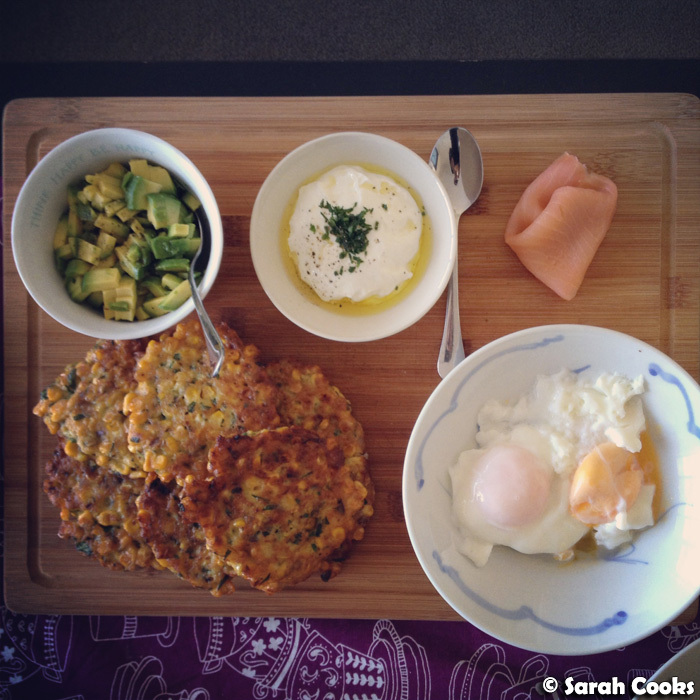 The breakfast, above, was my take on that ubiquitous cafe staple of corn fritters. I googled a few recipes to get a general idea of how to make them, and then ended up doing it my own way. 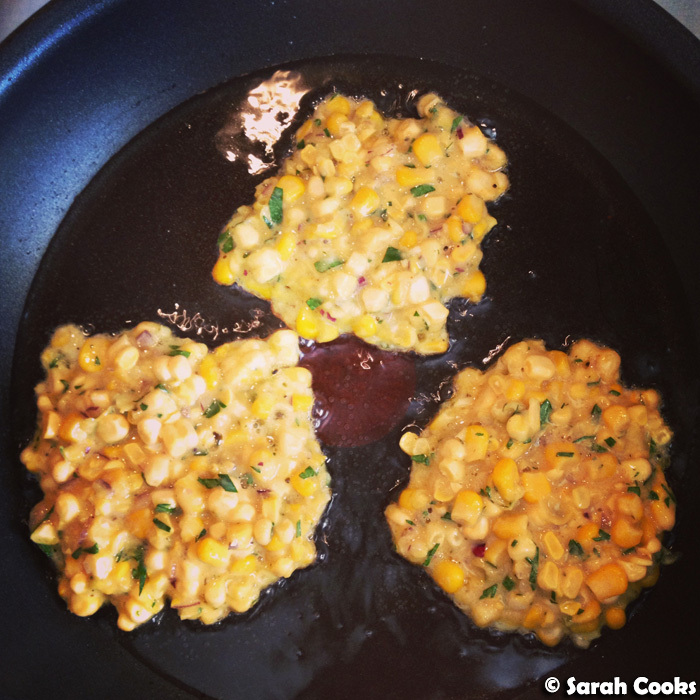 Basically I wanted maximum corniness: loads of corn kernels just bound by a little batter. 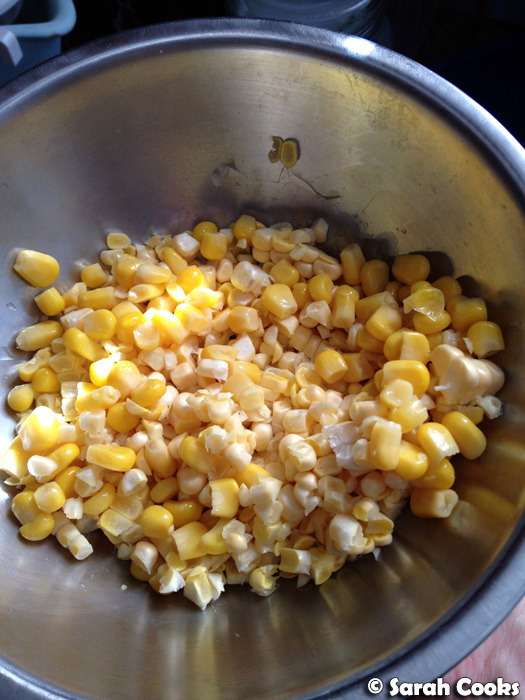 I used the kernels of a fresh ear of corn, and boosted quantities with a small tin of corn kernels, because this is what I happened to have in my fridge and pantry - for ease, in the recipe below I've specified either two ears of corn or a normal-sized (400 gram) tin of corn kernels. I loved the golden, corn-studded batter! Shallow frying! One tip: this batter is quite delicate, with the corn kernels barely held together by the batter, so don't be tempted to flip the fritters until they are well and truly sealed on the bottom, and cooked at least half way through, otherwise you'll be in for a big mess! (As I write this, it occurs to me that you could deep-fry tablespoons of the mixture for a super-crispy result, but I feel that would be more canapé than brunch). Other ideas I had for sides: bacon, fried eggs, halloumi (like St. Ali's corn fritters), tomato relish (or any expensive relish/chutney/salsa that you have languishing in your pantry), guacamole, pico de gallo... anything you like, really! They're turn out quite sweet (corn, duh), so salty accompaniments work well. For the maximum corn-experience, why not wrap them up in a corn tortilla? But you know what? Even if you eat these plain, they're pretty damn good. They're super-corny, nice and pancakey on the inside, and with fab crisp edges. Despite being fried, they feel light and bright and delicious. It's totally worth setting aside your Sunday morning to make these! 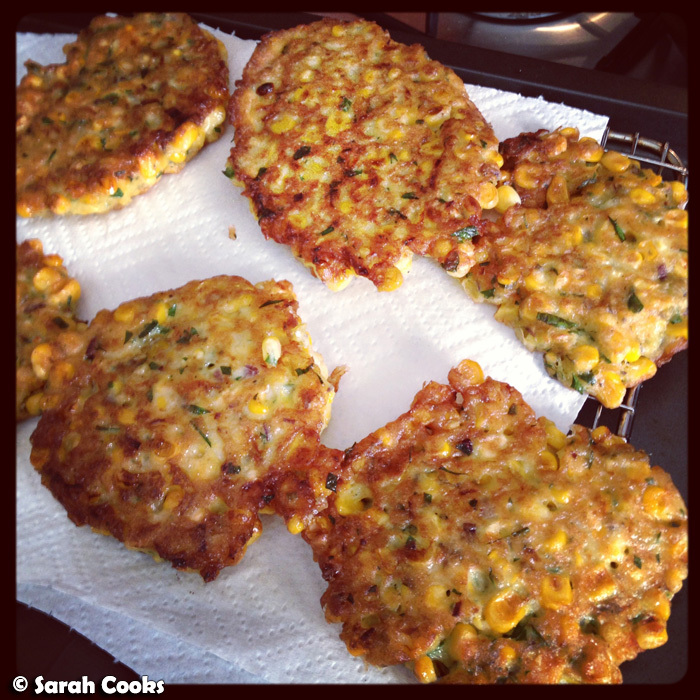 An original recipe from Sarah Cooks, inspired by the multitudes of corn fritters at Melbourne's cafes! 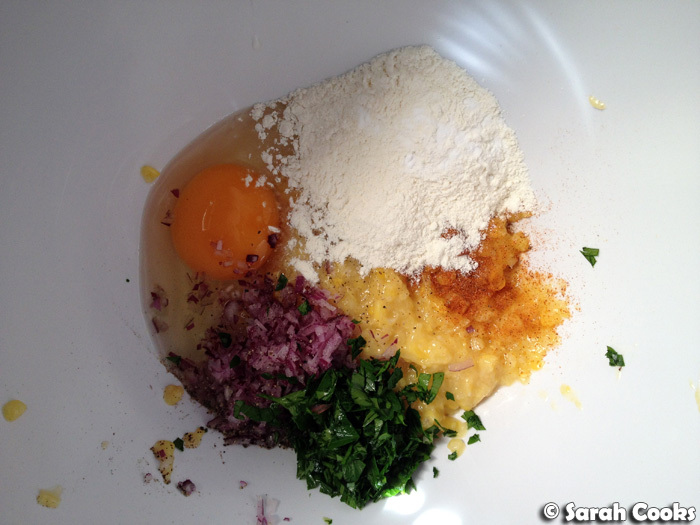 Place all the ingredients except for the corn kernels in a mixing bowl, and whisk to combine. Season with salt and pepper to taste. 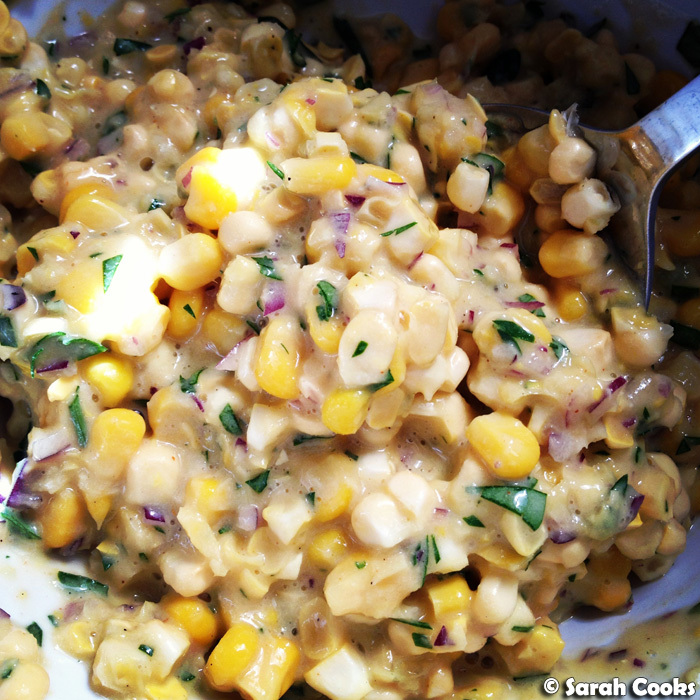 Slice the kernels off the corn (or open the tin of corn!) and add to the bowl. Heat a layer of vegetable oil in a non-stick frying pan. Cook spoonfuls of the corn mixture in the hot oil for about three minutes a side, only flipping when the fritters are sealed on the bottom. Place the corn fritters in a 75C oven as you cook the rest of the batter. Makes 6 fritters, serves 2-4 depending on how hungry you are and what you serve them with. Yum, these look delicious! The addition of creamed corn is a great idea. Oh corn fritters how I love thee! Your's looks scrumptiously good!